The Air Force said the tanker passed 1,600 pounds of fuel to an F-16. The new refueling boom is a rigid tube that telescopes out from the aircraft’s rear underbelly to feed jet fuel to other aircraft. In perfect weather for a test flight Sunday, Boeing’s KC-46 tanker successfully passed jet fuel to an F-16 jet fighter in the air, the first time the new tanker has accomplished an air-to-air refueling mission. The Air Force said the tanker passed 1,600 pounds of fuel to an F-16 piloted by Lt. Col. Daniel Alix, 416th Flight Test Squadron, 412th Test Wing out of Edwards AFB, Calif., who characterized the mission as a complete success. This was the first test of Boeing’s new advanced refueling boom, a rigid tube that telescopes out from the aircraft’s rear underbelly to feed jet fuel to other aircraft. During the air-to-air connection over Eastern Washington, the boom was controlled by Master Sgt. Lindsay Moon, seated at a computer station just behind the cockpit. He used a 3-D video image fed from high-resolution cameras at the base of the plane’s tail to guide the boom into the fuel receptacle behind the cockpit on the F-16. Testing this sophisticated new computer-assisted technology is a significant milestone for the Air Force’s next flying gas station. In previous-generation tanker aircraft, such as the KC-135, the boom operator lies face down in a pod at the rear end of the jet with a window providing a direct view of the receiving aircraft. Within days, Boeing expects on another test flight to refuel a different military jet, the large C-17 transport aircraft, which also receives the fuel from the extended boom. Later, the flight tests will move on to pass fuel to three other types of military aircraft. An A-10 ground attack jet will be refueled using the boom. 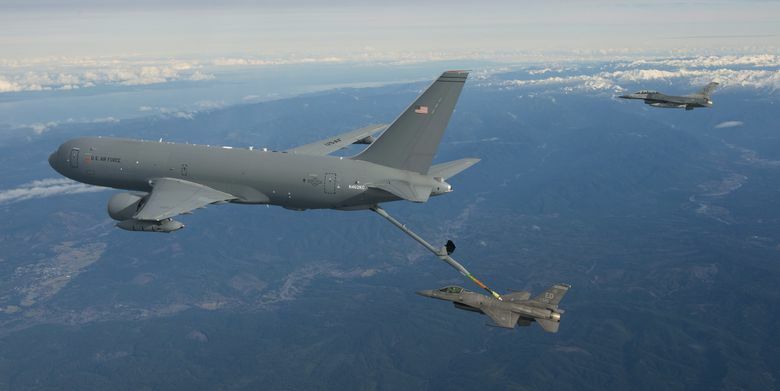 And an F/A -18 fighter and an AV-8B Harrier attack jet will each be refueled using the KC-46’s alternative air-to-air refueling method: a hose-and-drogue system. Those aircraft will take fuel from a flexible hose that trails from pods on the wings of the tanker or from the fuselage. At the end of this pipeline, a basket-like device called a drogue helps stabilize the hose in flight and acts as a funnel through which the receiving aircraft connects a probe to the hose. Finally, the KC-46 must also show that it can receive fuel in the air from older KC-10 tankers. Boeing must successfully connect the KC-46 tanker in flight with all six of these military jets to get the formal go-ahead from the Air Force to begin production, a decision set for April. However, because of previous delays and the tight timeline, Boeing has already begun building production tankers in Everett, hoping that any changes necessary as a result of flight test discoveries will be minor. The KC-46 test plane first flew in September and had conducted 31 test flights before Sunday’s refueling test, some with the boom deployed to assess its stability in flight. A separate 767-200C test plane — one that lacks the refueling systems but has the same airframe based on Boeing’s 767 commercial jet — has completed more than 90 test flights. That aircraft is undergoing ground tests and is expected to fly again soon. Two further test planes, a KC-46 fully equipped with the refueling systems and another 767-200C airframe, are expected to join the test program by the summer. Flight tests will continue through the end of the year. Boeing has to deliver the first 18 operational tankers to the Air Force by August 2017. Information in this article, originally published Jan. 24, , 216, was corrected Jan. 25, 2016. A previous version of this story incorrectly stated that the F-16’s refueling receptacle is on the jet’s “forehead.” That’s an accurate description of the receptacle’s position on a larger aircraft such as the C-17, but on a fighter like the F-15 it’s positioned behind the cockpit.